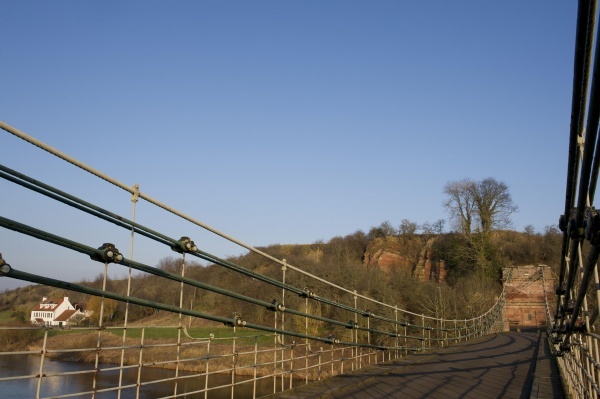 The Union Chain Bridge spans the River Tweed between Horncliffe, Northumberland, England and Fishwick, Borders, Scotland. It was designed by Captain (later Sir) Samuel Brown RN, who held patents for the design of the chains, although Brown altered the tower and abutments on the suggestion of John Rennie. 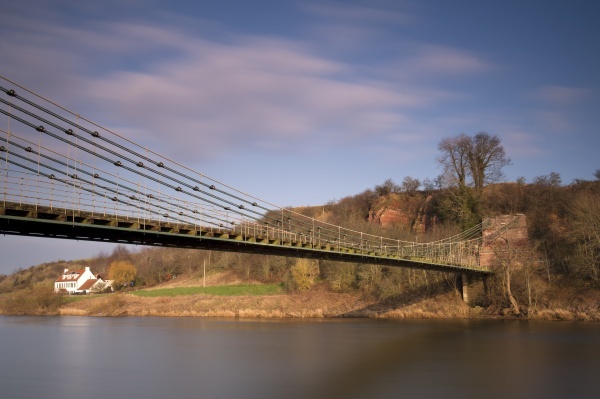 When it opened in 1820 it was the longest wrought iron suspension bridge in the world with a span of 137 metres (449 ft), and the first vehicular bridge of its type in the United Kingdom. It cost £7,700 to construct and pre-dates the Clifton Suspension Bridge and the Menai Bridge, which are of similar design . Today it continues to carry traffic, and visitors can enjoy pleasant walks along the river bank. Just up the hill from the Union Chain Bridge on the English side is the Chain Bridge Honey Farm, where there is situated a permanent exhibition on chain suspension bridges. Downstream on the Scottish side is Paxton House, where visitors can see Alexander Naysmith's depiction of Union Chain Bridge, painted before its actual completion. The OS reference for the Union Chain Bridge is NT933510. Very interesting tower in the grounds of a beautiful country house. Privately owned - we have met the owners on both our visits and each time they were very welcoming and very happy to answer any questions about their tower. The tower has good interpretation boards explaining the history of the tower and there are great views from the top. Hidden away, in the midst of glorious countryside. Located in landscaped gardens. This is a wee gem of a place. An honesty box secures entry and its worth every penny (so don't cheat). Wonderfully annotated local history - reivers et al. A well looked after and preserved building that looks small but rewards well. Fabulous views from up top if a little unnerving for someone with no head for heights. Definitely go. Oh and there are decent, clean, washrooms that would shame many a bigger attraction. 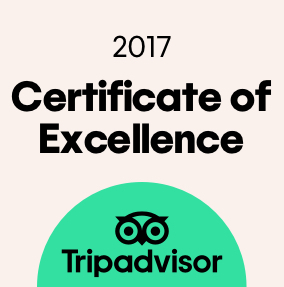 A charmingly personal feel to this impressive tower with plenty to learn from the handwritten signs and recreated room settings. A fully working tower clock which is apparently a mini version of Big Ben - be sure to be on the top floor on the hour to watch it strike! Parents - take care to be ahead of your children as you go up to the roof level as although there are safety barriers they would be easily climbed by a curious youngster. We thoroughly enjoyed a peaceful half hour here with our children (8 and 10) and it was £5 (paid by cash in the honesty box). There are toilets across the parking area back near the driveway. Only 1.5 miles off the A1 and with plenty of picnic benches this would be a lovely, tranquil spot to break a long journey. This was such an interesting place. The handwritten information sheets add to its authenticity and provide a connection to lives people must have led in those times of constant battle. I don't usually read to the end but I read every word of every sheet because the stories were so captivating. It was not busy when we went so it was good to take a leisurely look around. The view from the roof is fantastic. It's not very high but the steps are steep so you'll need to be steady-footed to get from bottom to top. Beware the clock if you're there on the hour as it's modelled on Big Ben and the bell is really loud. Some nice short walks in the grounds. The £2 honesty box is very reasonable. This is a pearl well worth searching for.